Updated Thursday, June 12, at 12:58 p.m.
Scott Milne, a little-known Pomfret Republican and travel agency president, said Thursday he'll challenge Democratic Gov. Peter Shumlin for the state’s top office. "Gov. Shumlin has demonstrated, in my opinion and in a lot of people's opinions that I talk to, that he doesn't have the right priorities and he's not done a good job of leading his party to get tough things done," Milne told Johnson. "I believe I have the ability to do a better job than Gov. Shumlin." In the days leading up to Thursday’s filing deadline, Milne sounded uncertain about whether he would make the leap from small business owner to statewide political candidate. And even as he announced his candidacy on WDEV, Milne left a little wiggle-room to back out. Milne will likely become the first choice of the Republican establishment, which has struggled in recent months to recruit a credible candidate. Other contenders, including Rep. Heidi Scheuermann (R-Stowe), retired Wall Street executive Bruce Lisman and 2012 Republican nominee Randy Brock all flirted with runs before opting out. If Milne ends up filing his nominating papers Thursday, he’ll join Emily Peyton of Putney and Steve Berry of Wolcott on the Republican ballot. Libertarian Dan Feliciano and independents Cris Ericson and Bernard Peters are also seeking the post. 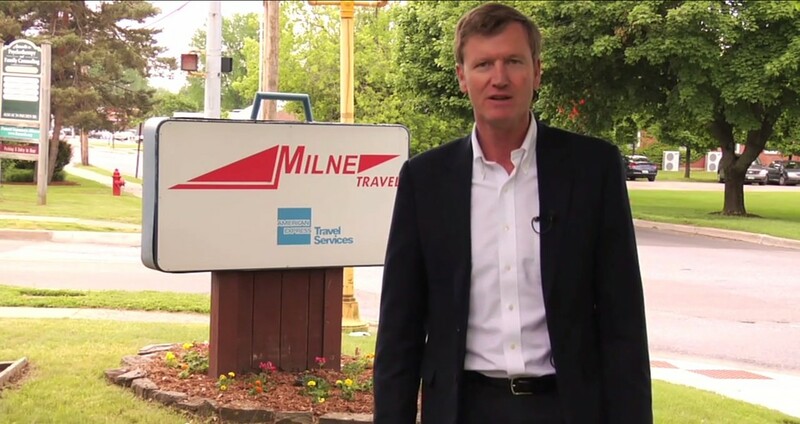 When he first expressed interest in a run early last month, the Milne Travel president said he hoped to wage a spirited, “issue-oriented” primary campaign against Lisman or Brock in order to draw free media coverage. He told Johnson that he has since had to “recalibrate” his strategy. “Rather than having debates to get issues out first and foremost, we’ll be working on a grassroots organization enabling folks to get to know me and the folks I’m going to be surrounded with a little bit better,” he said. Milne acknowledged that he would be heavily outspent by Shumlin, who reported in March that he had more than a million dollars in his campaign account. The Republican estimated he would “probably” raise and spend $200,000 on his own run. “I think… people are getting sick of, you know, $3 million governor campaigns in Vermont,” Milne said. Milne criticized the incumbent for failing to address the state’s education funding system and for declining to disclose how he would pay for his proposed single-payer health care system. Shumlin, a longtime state senator who won his first gubernatorial election in 2010, filed papers Monday to run for reelection. Correction, 1:32 p.m. 6/12/14: An earlier version of this blog post gave the wrong date for when Shumlin was first elected governor.